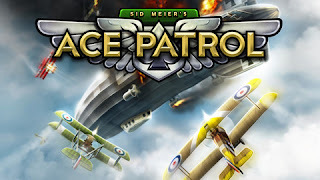 With all of the buzz about the much-anticipated Eclipse coming out, some of you may have overlooked the release of what I think is one of the premier, tip-top games ever released for iOS, Sid Meier’s Ace Patrol. Ace Patrol is a turn-based, World War One dog-fighting game that is essentially a Wings Of War analog, and with crisp graphics, an incredibly smart design, and responsive interface, is both very fun and addicting. This game is simply astounding, and the best part is that it’s completely free for both iPhone 4+ and Ipad 2+ devices. This game has a minimal RPG aspect to it because as your campaigns progress, provided you accomplish your missions, you gain pilot perks and plane upgrades. The former allow you to perform advanced maneuvers such as the Wingover, the Split-S, and the Immelmann turn. The latter provides you armor upgrades, more damaging guns, and more accurate fire. As you progress through a campaign, your planes can take so much damage that they are out of action a set amount of missions, and if you crash and burn your pilots can be either captured or injured, taking them out of action for a spell. In between each group of missions your captured pilots can be traded back to you during the “Christmas POW swap” and are available to you again. The game is highly focused on the maneuvering and combat, with a scenario-driven design, but there are actually four playable campaigns: American, British, French, and German. The game, as downloaded, has only the American campaign, made up of 30 missions (I believe it’s 30), the first two being “training missions”, but for a $4.99 IAP you can unlock the remaining three campaigns, for a total of 120 missions. I can guarantee you that it’s well worth the five bucks to get the full monty. I should also note that there are five difficulty levels, with the ACE level being in the middle of the pack and the “sweet spot” that keeps it from being too mind-bendingly hard, at least for me. There’s also a bunch of “aces” which are pilot add-ons that you can purchase for $0.99 each, but I’ve not bought them, nor will I. I just don’t see the benefit, but if you do, well, have at it. Additionally, if your pilots are injured, captured, or if your planes are damaged, you can pay $0.99 in an IAP that heals them, or repairs them, respectively. This is another thing I’ve never used, nor will I. It’s cheaper to simply restart the campaign, and I’ve done this a couple of times, and start fresh. It’s not like you get a gaggle of naked chicks coming over to rub on your boy parts if you get a high score, right? I’ve beaten all four of the campaigns at this point, on Ace difficulty, without buying anything, so I’m not sure that I’m really missing out on the IAP upgrades. There are some super-planes that are available for purchase, and I suspect that on the harder difficulties these are required if you plan to not get the hell shot out of you. I will tell you that if you have a couple pilots down or injured, the game becomes “oh my God” difficult. It’s a really good idea to mix up your pilot choices to get them all upgraded because when the campaign is winding down, if you get stuck on the hardest missions with green pilots, you’re completely bollocksed. There is going to be no parade for you. In addition to the single-player campaigns, there’s also multi-player support in the form of Game Center and hot seat selections, although Game Center doesn’t appear to work at this point. Hot seat, though, works very well, with my only complaint being that all maneuvers and planes are unlocked, which means you’ll always be fighting with the best possible load-out. This means that there’s no handicapping if you’re playing with someone less experienced than you, and therefore you will stomp their face into the curb pretty much every time. The short version is that if you enjoy turn-based tactical games, this is the game for you. It’s an amazing game, and especially because it’s free, you need to jump on this. I’ve been playing it every single day since I bought it during smoke breaks and while the wife is watching Netflix, and I’m still not sick of it, which is a testament to it’s awesomeness. It’s just a smashing good game that I think pretty much anyone can enjoy. I won’t belabor the point: download this game TODAY.